The Most Elegant Powder Room. One of the more popular rooms that I designed. 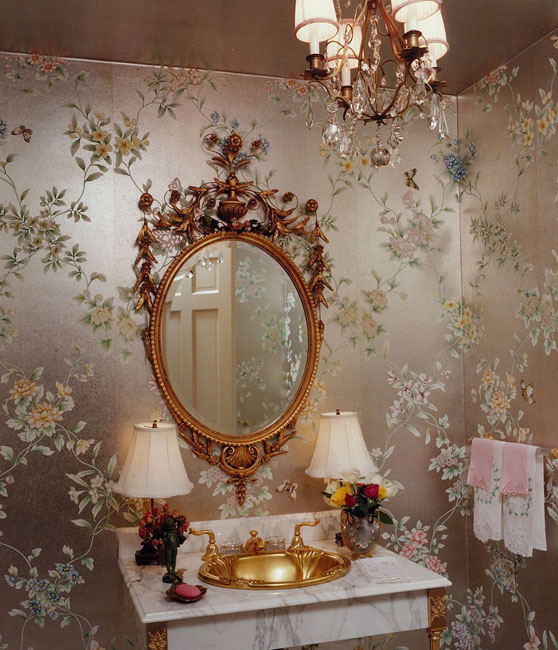 With a Sherle Wagner 24k gold sink, faucets, a marbel vanity, this Powder is breathtaking..
As in one of the Dining Rooms on this site, I used the same company that did the custom hand painted wall paper. Each wall is custom fitted for the paper as I drew each panel in elevation and to scale for the individual wall space. The backround of this paper is very under stated silver leaf with delicate pastel hand painted floral motif.The photo is a very high resolution one and if you know how to enlarge the pic, you will be able to zoom into the details of the paper design.The close-up in-person beauty of this paper is mind boggling. The mirror is a fabulous Adam's Repro. of which the vendor has many other impressive reproductions to choose from.